With a higher metabolism and a big personality, your little family member deserves natural nutrition and flavor every bit as much as the big guys from puppyhood to adulthood. 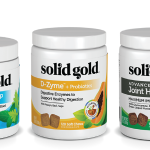 Solid Gold has crafted a dog food with the perfect balance of fresh bison protein, healthy fats and whole grains into bite-sized kibble for all lifestages. 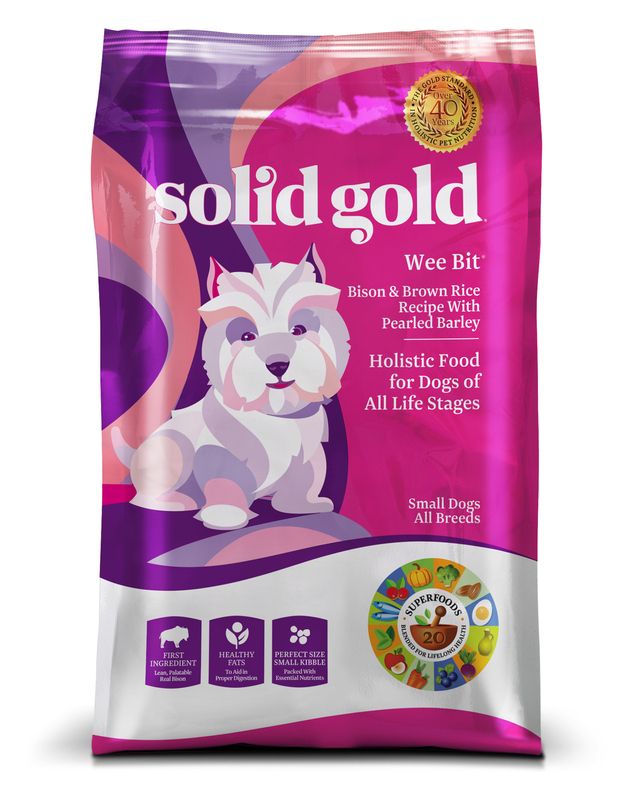 Every small kibble is packed with just what’s needed to unleash your wee one’s big-time inner gold! Natural, holistic dry dog food with added vitamin, minerals and amino acids *All-life-stages bison & brown rice recipe formulated for small breed dogs. Tiny kibble – easy to eat and packed full of the nutrition they need for those fast metabolisms. Crafted with Bison, Brown Rice, Peas, Oatmeal and other wholesome and nutritious ingredients. Ingredients: Bison, Ocean Fish Meal, Brown Rice, Peas, Canola Oil (preserved with mixed tocopherols), Oatmeal, Pea Protein, Dried Eggs, Rice Bran, Pearled Barley, Salmon Meal, Tomato Pomace, Natural Flavor, Flaxseed, Salt, Choline Chloride, DL-Methionine, Potassium Chloride, Salmon Oil (preserved with mixed Tocopherols), Taurine, Dried Chicory Root, L-Carnitine, Carrots, Pumpkin, Apples, Cranberries, Blueberries, Broccoli, Parsley, Spearmint, Almond Oil (preserved with mixed Tocopherols), Sesame Oil (preserved with mixed Tocopherols), Yucca Schidigera Extract, Dried Kelp, Thyme, Lentils, Vitamin A Supplement, Vitamin D3 Supplement, Vitamin E Supplement, Zinc Sulfate, Niacin, Ferrous Sulfate, L-Ascorbyl-2-Polyphosphate (Source of Vitamin C), Calcium Pantothenate, Thiamine Mononitrate, Copper Sulfate, Riboflavin, Pyridoxine Hydrochloride, Manganese Sulfate, Zinc Proteinate, Folic Acid, Calcium Iodate, Manganese Proteinate, Copper Proteinate, Sodium Selenite, Biotin, Vitamin B12 Supplement, Rosemary Extract, Dried Lactobacillus Acidophilus Fermentation Product, Dried Enterococcus Faecium Fermentation Product, Dried Lactobacillus Casei Fermentation Product. 2 Features: Perfect size for small dogs and puppies. Bison based. 2 Benefits: Perfect starter kibble for small breed puppies with its very small size. This food tastes great all my dogs and puppies Love this food! 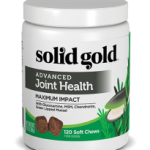 Review: I have used this food for years and all of my dogs love it. I have dogs ranging in size from 3# to 18# . I love this food as a starter kibble for the babies and I send it home with all of my puppies. It’s even a nice size to use as a training treat as they can chew it quickly. An all time favorite at my house! 2 Features: the 1st 3 Ingredients are the best! Review: I foster Miniature Pinschers – and this food is so easy for them to eat. It is a little expensive so I try and mix it in w/ another dog food.